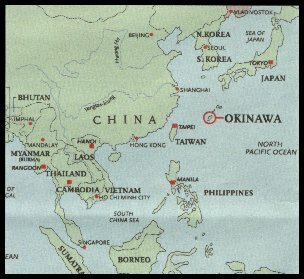 Karate (empty hand) originated in Okinawa, which consists of many Ryu-kyu islands, about 400 miles south of mainland Japan. In the 1600s the Japanese samurai ruled supreme and weapons were forbidden to the Okinawans. In secret they refined what we now call karatedo, or the way of the empty hand, until their unarmed bodies were as deadly as the swords taken from them. In the more settled times that followed, the art became valued for its health, strength and character enrichment. Okinawan karate is a cultural treasure and oral tradition that has spread throughout the world and is practiced by millions. 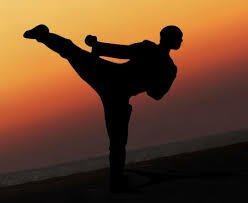 We teach karate as weaponless self-defense, and it is emphasized as a martial art rather than a sport. It's not about winning tournaments but prevailing over an assailant of any size or strength. Safety is paramount! Students are not intimidated, but encouraged to reach for and attain their highest potential. Achieve confidence and expertise while having fun. Improve life skills including a deeper respect... for yourself and others. Learning from and helping each other, and using skills effectively and with good judgment is the true art of karate. Promoting good health, self-control, calmness and genuine confidence, while reducing stress and any tendencies toward inappropriate aggression. Providing skills and attitude necessary for confidence in and reliance on themselves, not only in the face of danger, but also in other facets of their lives. Assisting them in building strong, erect bodies, learning patience and respect for others, and gaining enduring confidence in themselves. Maintaining and in most cases improving balance, coordination, agility, flexibility and overall vitality. YOUTH KARATE, Ages 4-13... read about our youth program. Blocks, kicks, strikes, safe falls and throws (flips/take downs) -- with power, efficiency and control. Specific solo moves combine techniques of defense and offense in sequence, so instant and correct reaction is natural if required to defend yourself. Complexity increases with rank. Easy-to-learn practical techniques to break free from an assailant, to use momentum, leverage and vital striking points to prevail in seemingly indefensible situations, regardless of size or strength. Practice of defense and offense skills with increasing difficulty while cooperating with each other so both partners benefit and improve. Rather than entirely a specific goal in itself, it also becomes a peripheral benefit -- a symptom of the strength and focus obtained as a result of karate training. Kicks and various strikes to perfect accuracy and balance. Prearranged (and "free") sparring enhances timing, reflexes, balance and coordination, as well as safe falls and throws…with strong emphasis on self-control. Difficulty increases with skill level. Intermediate to advanced ranks. 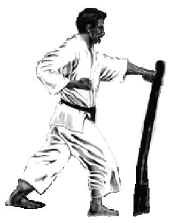 Effective application of kata with three or four attackers, including safe falls and throws. Increases spatial awareness, agility and control. Advanced ranks. To condition and strengthen while precisely focusing the power of your entire body to a single point. Advanced ranks. (1) Place the middle of the belt in front of the body. 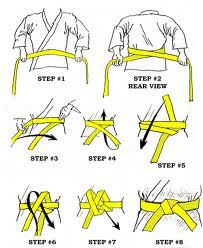 (2) Wrap belt around the back, overlap, and (3) bring back to the front. (4) Make an X with the ends. (5) The top end goes under both segments of the belt from (6) bottom to the top. (7) Tie knot. IMPORTANT: Gi pants must not touch the floor. If so, they need to be hemmed for safety reasons — our first concern! Floor length can result in a fall. Rolled-up (they never stay) distracts the student and can be very dangerous. Correct length is just below the ankle, or above it but below the knee. The bow in karate is often misunderstood. It holds no spiritual or religious connotation, nor is it a sign of a master-slave relationship between instructor and student. Instead, the bow is a cultural practice done to show humility, appreciation and a willingness to learn. It is also a display of mutual respect between teachers and students, and fellow students. It most closely correlates with the Western tradition's handshake. 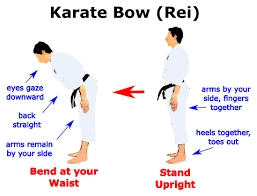 The bow is from a kneeling (Seiza) or standing position. Students bow when entering the dojo (training area), clearing their minds of distractions, committing to fully focus on and attempt to absorb the material about to be taught. Bowing toward instructor is to show respect and gratitude for the time and energy devoted to sharing his/her experience, skills and knowledge. 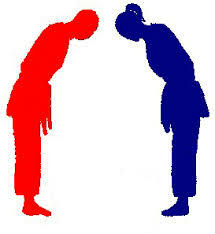 Bowing is to be done between students before and after kumite, bunkai and partner drills. The ending bows express thanks for furthering each other's skills, and the learning about themselves and their partners. Bowing upon exiting the dojo signifies that training has finished -- for the moment or for the day -- until time to return. Left knee down first then right knee, with right great toe crossed over left great toe; knees apart; sit on feet; hands on thighs. Left hand down first, then right. Bow ("rei"). Right hand up first, then left. To rise: Right knee up first, then left into standing position. See also The Bow. No attacks are initiated by a karate practitioner. Instead there is love of peace, pursuit of harmony and respect for humanity. Courtesy and respect toward your superiors, equals and beginners is necessary for personal growth. Kata, kumite and bunkai practice must be done with sincere belief that you are facing an actual enemy. Do not hold a critical attitude toward your instructors or your progress will suffer. If you do not understand, ask your instructor to explain. A solid foundation must be built carefully and cannot be rushed. Only through perseverance and patience will you reach your goals. Dedicated practice will bring desired results. To be humble of your skill begets more practice, and thus more skill. Karatedo will help students ("karate-ka") achieve: Humility, integrity, and respect for themselves and others, as well as a spirit of cooperation with fellow karate-ka, assistant instructors and other higher-ranked students ("sempai"), and the teacher ("Sensei"). Address as Sensei: Sharon Basinger, Head Instructor, and Seikichi Iha, Grand Master…always. In Basinger Sensei’s absence, black belts while instructing at Karate STL. Black belts while instructing at other dojos. Ask Basinger Sensei if in doubt. Address as Sempai or Mr./Ms: Sensei's assistants and karate-ka higher ranked than you but below black belt – Sempai, or Mr./Ms., then last name, or first name if they prefer – e.g. “Sempai Chris” or “Mr./Ms. Chris.” Ask Sensei if unsure. Observers/Parents are very welcome, but ALL ages are kindly requested to remain on sideline very quietly and unobtrusively -- no cell phone talking, or communicating with students while they are in class please. If absolutely necessary to enter training area, please remove shoes. This is out of respect for students, instructors and dojo. When late, no problem but it's impolite to simply walk into class. Instead, quietly warm up by yourself, apart from class. Then do not join the class yet …stand and wait, just inside the dojo, until instructor signals you to enter. During class, do not leave training area early, or leave for a break, water, to talk to observers, etc., without clearing it with instructor. Wait to be notified by Basinger Sensei, as to if or when you will test for promotion, rather than inquiring. Respect all instructors/sempai and follow their directions without question, comment, hesitation or facial expression while in dojo. For clarification, ask Basinger Sensei privately, apart from others, outside class. When interacting with other karate-ka, especially those lower in rank, ALWAYS consider their age, skill level, size, strength and any limitations. Then adjust your speed and power accordingly. Help each other! SELF-DEFENSE... read about about our self-defense programs. (left) began training in Shidokan in 1989, and has been the director/chief instructor at Karate STL since its inception in 1995. She attained the internationally recognized and documented title of Shihan (certified instructor), and rank of 6th Dan (black belt degree), awarded by world-renowned Grand Master Seikichi Iha, Hanshi 10th Dan (right), and the Okinawa Shorinryu Karatedo Association. Karate STL and Basinger Sensei are under direct supervision & guidance of Iha Sensei, who is the President of Beikoku Shidokan Karatedo Association. Basinger is that Association's Shibu (branch) Dojo Director in the state of Missouri. She also actively oversees two Fuku Shibu* (sub-branch) dojos, comprising four separate training locations, in addition to Karate STL. Basinger previously studied judo, and other styles of karate but she and her late husband, Gordon Basinger, concluded that Shidokan not only promised but also provided the authentic training and philosophy they had been seeking all along. Ameer Syed (above left), Sensei* 4th Dan. Tony Bui (below left), 4th Dan. Stephanie Faulkingham (above right), Sensei* 3rd Dan. George Fortier (not pictured), 2nd Dan. Kevin Queen (below right), 1st Dan. Not pictured: Glenda and Bryan Petrofsky, and Kristina Carpenter, 1st Dan. Junior Black Belts (not pictured) are Laura Jenkins, Tawni Miranda, Krystal Carpenter and Candice Turner. As a supplement to their training, these dedicated students also travel when possible with Basinger Sensei to Lansing, Michigan, for even further instruction from Iha Sensei. Kevin Queen and Tawni Miranda accompanied Basinger Sensei on her most recent Okinawa trip. They all began as white belts and have since achieved their internationally certified ranks due to diligent training at Karate STL. * Fuku Shibu (sub-branch) Dojos... are under the guidance and supervision of their Shibu (branch) Dojo Director -- in this case, Basinger Sensei -- who is directly under the Hombu (headquarters) Dojo Director, Grand Master Seikichi Iha, Hanshi 10th Dan. Basinger Sensei is proud of her students and was very pleased to approve and recommend dojo certifications, for the above referenced Fuku Shibu Directors. Grand Master CHOSHIN CHIBANA, Hanshi 10th Dan (1885-1969), born June 5, in Shuri City, Okinawa, began training in 1900 at the age of 15 with Grand Master YASUTSUNE "Anko" ITOSU. Itosu Sensei is considered the Father of Okinawan Karate and is the first person responsible for publicly teaching the art. Chibana Sensei was the originator of Okinawan Shorinryu, loosely translated as "small forest style" or "pine forest style." 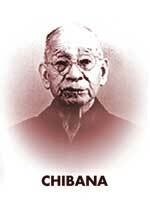 He also formed the Okinawa Shorinryu Karatedo Association in 1950 and was its first president. Among Chibana's many awards was the Kunyonto (4th) Order of the Sacred Treasure presented by the Emperor of Japan, Hirohito, for his devotion to the study and practice of Okinawan karatedo. He taught almost until the time he died of cancer at the advanced age of 83. His successor was Katsuya Miyahira. Chibana Sensei's thoughts and advice on karate. Grand Master KATSUYA MIYAHIRA Hanshi 10th Dan, was born on August 8, 1918 in Nishihara City, Okinawa, and died on November 29, 2010 in Naha, Okinawa, at age 92. 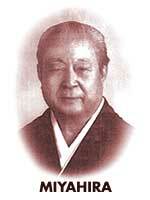 Miyahira Sensei started his training with Grand Master Choshin Chibana at age 15. In 1937, he worked as a school teacher in Manchuria and taught self-defense. He opened a dojo in Kanehisa, Nishihara, in 1948 naming it "Shidokan." 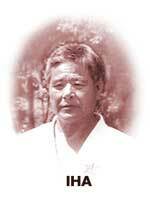 After Chibana Sensei's death in 1969, Miyahira became the President of the Okinawa Shorinryu Karatedo Association. He was presented with the 1989 Martial Arts Distinguished Service Award (the highest honor of its kind in the world of Japanese martial arts) by the president of the Japan Martial Arts Council. Among Miyahira's major contributions has been the introduction of obligatory analytical exercises (bunkai) for each of the kata, and the deepening of the philosophical study of karatedo. His most senior student is Seikichi Iha. Miyahira Sensei's thoughts on karate and life. Grand Master SEIKICHI IHA, Hanshi 10th Dan: Karate STL and Sharon Basinger are directly under the supervision and teaching of this world-class master. He is United States Branch Chief for the Okinawa Shorinryu Karatedo Association, and the President of the Beikoku Shidokan Karatedo Association. A "teacher of teachers," Iha Sensei is the highest ranking Okinawan master residing in the United States. In 2001 Iha was awarded the rank of 10th Dan from Grand Master Katsuya Miyahira. There was an enthusiastic standing ovation of world-wide friends, family and hundreds of his students at the Beikoku Shidokan 25th Anniversary Celebration in Lansing, Michigan. Iha was born in Nishihara City, Okinawa, on July 9, 1932. His initial karate training was with his uncle but in 1950 he became a student of SHINPAN GUSUKUMA, a student of the famous Anko Itosu. After Gusukuma's death in 1954, Iha began training with Miyahira Sensei. He has taught in Guam, the Philippines and Okinawa (in 1964 he also trained U.S. Marines at Futenma, Okinawa). 1967 to 1975 he taught in Los Angeles, California. In 1975 he opened his Lansing, Michigan, dojo which is now headquarters for over 30 schools in the U.S., Canada and other countries as distant as Sweden and Israel. Iha is frequently visited, consulted and revered by karate practitioners from around the globe. What Iha Sensei hopes for his students. Iha Sensei biography, and an interview on karate. Beikoku Shidokan Karatedo Association, Seikichi Iha, Director. About; membership application; association directory; events; and more. Okinawan, Shorinryu, and Beikoku Shidokan karate history. Biographies of great masters: Matsumura, Itosu, Chibana, Gusukuma, Motubu and Miyahira. From 1995 to the present.